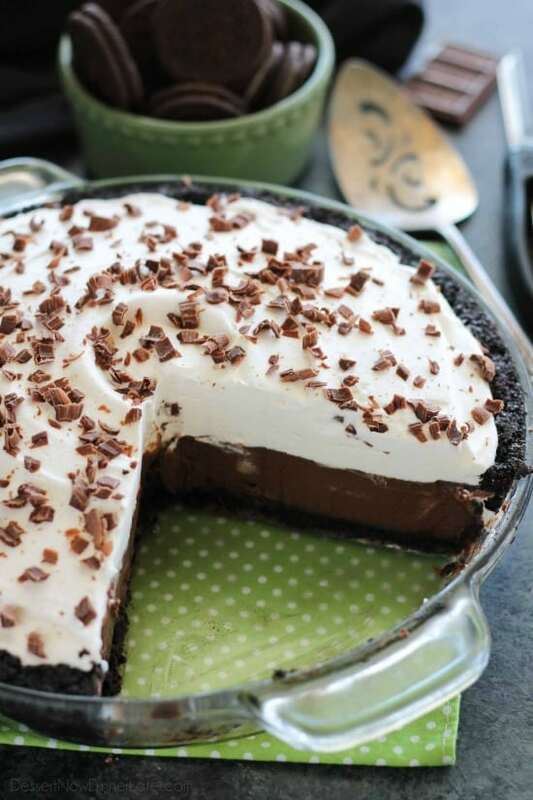 Chocolate Pudding Pie - Dessert Now, Dinner Later! *This is a sponsored post on behalf of DairyPure®. Thank you for supporting the brands that make Dessert Now Dinner Later possible. 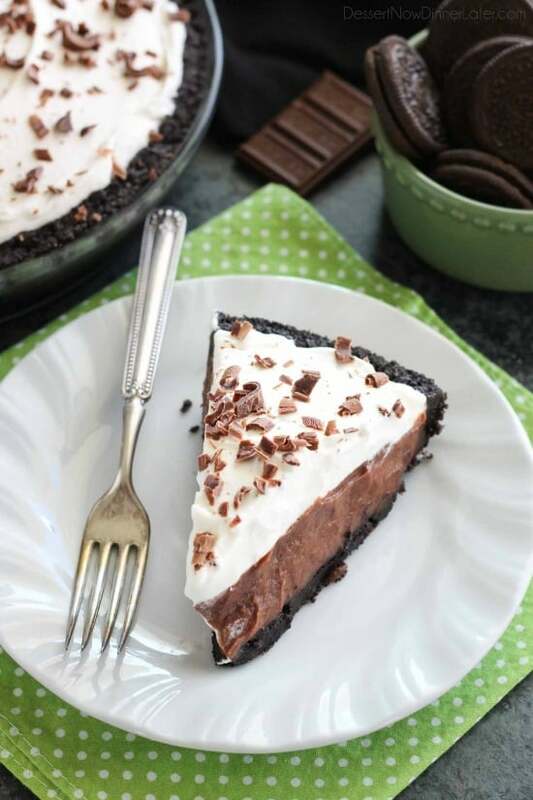 Homemade chocolate pudding topped with sweetened whipped cream, all nestled inside a chocolate cookie crust, makes the most delicious no-bake Chocolate Pudding Pie. 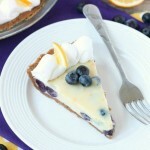 One of my favorite desserts hands down is pie! 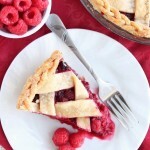 It was my dessert of choice as a child for my birthday “cake.” I’m always a sucker for apple or mixed berry pie, but every now and then I love to make a no-bake pie. 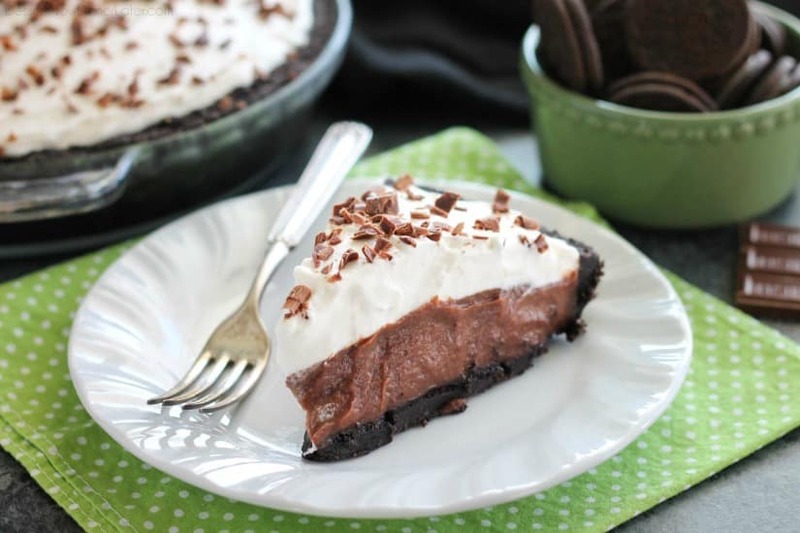 This Chocolate Pudding Pie is easy to make and will definitely satisfy that chocolate craving! 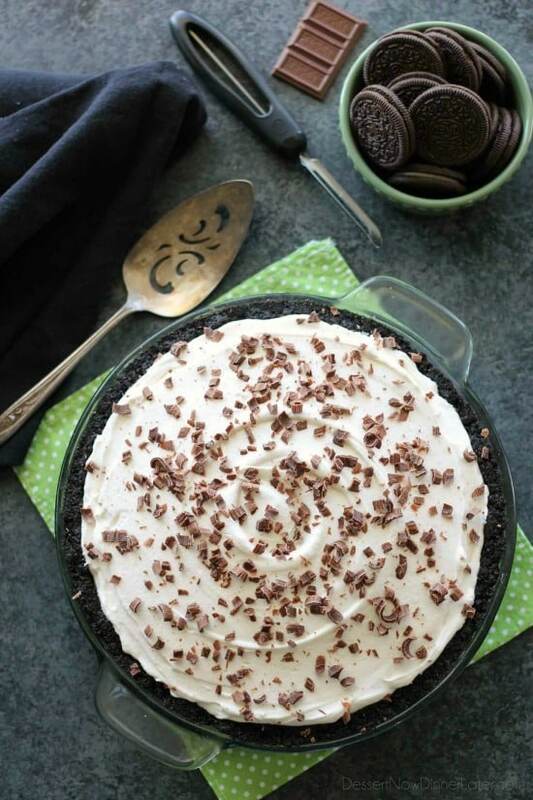 This Chocolate Pudding Pie starts with a no-bake chocolate cookie crust. I’ve found the perfect combo of cookies to butter, so that it won’t crumble and fall apart. I’ve even found that pulsing my crumbs extra fine helps too. The second layer is homemade chocolate pudding, which is easier to make than you think. Sure it’s not a box mix, but when you taste the difference between the box, and the real deal, it’s worth a little extra time. If you’re like me, you stock up on milk for the holidays. Breakfast casseroles, bread pudding, mashed potatoes, frosting, pie! So many uses! The DairyPure heavy whipping cream whips like a dream and stays nice and stiff for the top of the pie too. My kids wouldn’t stop licking the pudding or the cream. 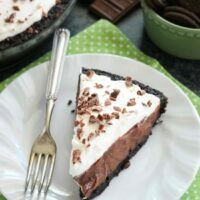 They’ve already asked me to make this chocolate pudding pie again! So creamy, rich, and delicious! 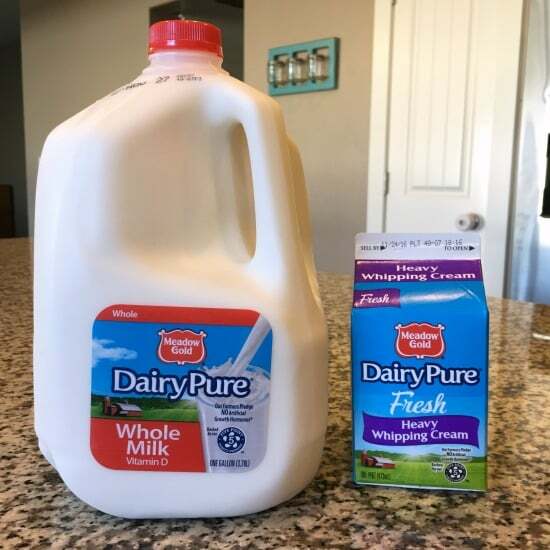 Visit DairyPure.com, and find DairyPure on Facebook and Pinterest for more recipe ideas and info about their products and purity promise. Crush Oreo cookies in a food processor or blender until really fine. Melt butter in a glass 9-inch deep-dish pie plate in the microwave. Add the fine cookie crumbs and mix together until evenly combined. 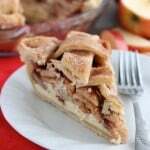 Use the bottom of a measuring cup to press the crumbs to the bottom and sides of the pie dish. Place crust in the fridge while working on the pudding. In a medium sauce pan, add milk and semi-sweet chocolate chips. Heat mixture while stirring over high heat until chocolate melts; about 1-2 minutes. Place egg yolks and sugar into a medium-sized mixing bowl. Whisk together with a fork until pale yellow. Add cornstarch, salt, and vanilla. Mix well. Pour warm chocolate mixture into the egg mixture, SLOWLY, whisking as you go so you don't curdle the eggs. Pour the mixture back into the saucepan and place it onto the stovetop. Over medium-high heat, bring mixture to a boil, whisking constantly until thick. (Happens suddenly when it reaches a boil.) Remove from heat and whisk vigorously for 1-2 minutes until creamy and smooth. Make the whipped cream: Pour heavy cream into a stand mixer with the whisk attachment. Beat until slightly thick, then add sugar and vanilla. Continue beating until medium-stiff peaks. Spread over pie. 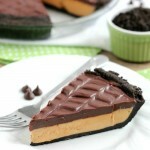 Use a vegetable peeler to cut chocolate shavings with the large chocolate bar over the whole pie. Serve and enjoy! Refrigerate leftovers. Can be made up to 24 hours in advance.